Prince Kuhio Condos are adjacent to Prince Kuhio Park and the ocean located on the sunny South Shore at Poipu Beach in Kauai. Our condo property is about 20 yards from the beach. Some of the best snorkeling and surfing on Kauai are right out front at Prince Kuhio Beach and Lawai Beach. The condo complex is small and quaint with ocean views, park views, and mountain views from your lanai. On the oposite side of the park, a tropical garden and pool cover the whole west side of the building. You will enjoy the sound of the ocean, the birds singing in the park, the rustle of palm fronds in the tropical breeze and amazing sunrise every day from your condo. Our condos are individually owned and nicely refurbished in a quiet, tropical setting near the beach. The condos vary is size from studio, small one-bedroom, or large one-bedroom which are about 500, 600, and 700 square feet respectively. There are some condos that are variations of the standard three sizes. Stunning Pacific oceanside, individually owned, one bedroom, vacation rental condos at Prince Kuhio by Poipu Beach located on the Sunny South Shore of Kauai, Hawaii. Amazing views of sunrises, ocean, mountain, park and tropical garden. Experience the Aloha spirit and ambiance in our fully equipped condominiums at Prince Kuhio, an excellent value vacation with accommodations at their finest. Your Poipu beachside base for all the activities Kauai has to offer, from breakfast and dinners on the lanai, watching spectacular sunsets, listening to the surf, snorkeling all around the area, surfing, reading your favorite book on the beaches right out front, beachcombing, swimming with the turtles, golfing, and much more. Looking for the perfect honeymoon, anniversary, wedding, or just relaxing in your own private tropical getaway location close to the ocean, our newly remodeled condos fit the bill. 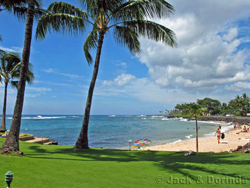 Start your Poipu vacation dreams by clicking on the specific unit pictures that interest you. This will take you to the unit individual Web site and start of your vacation plans. You will be working with the owners at Prince Kuhio by using this Web site and you will be corresponding directly with those who know the units building and surrounding attractions. listed on this site, please contact us.